This review was published by Shelf Awareness on January 10, 2017. 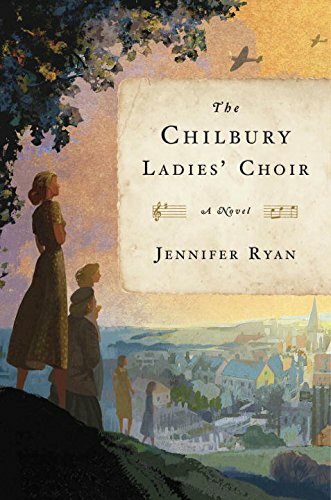 Jennifer Ryan’s first novel, The Chilbury Ladies’ Choir, takes on a wide range of the human experience through the lives and voices of the women of the village of Chilbury, in the south of England, at the beginning of World War II. In addition to Mrs. Tilling, the reader is introduced to a cast of characters in turn, each of whom speak in the form of letters and diary entries. Miss Edwina Paltry is the town’s sly midwife, who in letters to her sister reveals herself to be secretly pursuing a fortune by any means: “I’ve been offered the most unscrupulous deal you’ll ever believe!” Kitty Winthrop is the 13-year-old sister to the lost Commander. Between her violently abusive father and distracted, pregnant mother, Kitty is left to her own devices to worry about boys, war and her hoped-for career as a professional singer, all of which she records in her diary. Her older sister Venetia, at 18, is a wildly boy-crazy beauty, and in letters to her friend Angela in London, recounts her difficulties in seducing the handsome new artist in town, Mr. Slater. In these personal documents we learn that a new music teacher has arrived from London. “Her name is Miss Primrose Trent, but she told us to call her Prim, which is funny as she’s not prim at all but frightfully unkempt.” The lovably misnamed Prim doesn’t see why a choir needs male voices, and promptly calls practices again. The Chilbury Ladies’ Choir meets some resistance, some grumblings about tradition, but as the war proceeds, the women learn to lean on one another. Eventually the choir becomes a central institution in the town, providing material as well as moral support, and a theatre for personal growth. After Mrs. Tilling’s son leaves to fight, she takes in a boarder, Colonel Mallard, who is working from a nearby base. Living with a stranger is a great challenge for her, but one of several she rises to as war comes to England. Venetia wins Mr. Slater, but experiences a life-changing accident. Kitty takes a position of leadership in the choir and suffers a massive disappointment. Miss Paltry’s plans go awry, and the town sees several new births, but also tragedy. The Germans bomb the English shore. The novel concludes in September, but these are an eventful few months. Occasional other voices join in to complete the picture, including the rare diary entry from Silvie, a 10-year-old Czech Jewish refugee billeted with the chaotic Winthrop household, and a few letters from Colonel Mallard to his sister. But it is the perspectives of Mrs. Tilling, Venetia, Kitty and Edwina Paltry that define the novel’s path. Encompassed in these experiences is all of life: love, hope, despair, loss, petty disagreements and great sacrifices. The Chilbury ladies learn to expand their horizons and their abilities, build new relationships and stand up for themselves. The epistolary form works nicely to establish intimacy, giving the reader a behind-the-scenes perspective and a feeling of being deeply engaged with Chilbury. The overlapping points of view offer the opportunity to make up one’s own mind who to believe, and to piece together a fuller picture of events when the characters try to keep secrets. Poignancy is abundant, with Silvie fully aware of her precarious status, and Mrs. Tilling desperately worrying over the life of her son. There are moments of humor, too: life cannot help but go on, even as the Germans fly overhead. The Chilbury Ladies’ Choir offers a world of emotions, experiences and characters in a tiny village, over a few months in 1940. Anxious Mrs. Tilling, devious Miss Paltry and the ever-evolving sisters Venetia and Kitty represent a wealth of possible reactions to an event bigger than themselves. In their variously sweet, mischievous, aggrieved and hopeful letters and journals, these ladies bring home the impact of world war. And in a village deprived of its men, they show that women can pull together and do anything that needs doing. The Chilbury Ladies’ Choir is an inspirational, sometimes sad, tale, and Jennifer Ryan puts it together with style. Come back next week for my interview with Jennifer Ryan.